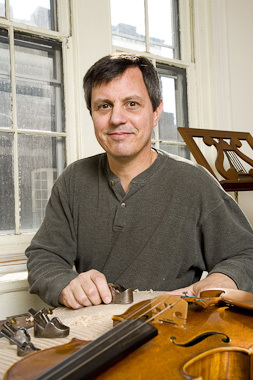 Christopher Germain began his career in violinmaking in 1982, as a pupil of Tschu Ho Lee at the Chicago School of Violinmaking. After graduating in 1985, he worked for the Chicago firms, Kenneth Warren and Son and Bein and Fushi, Inc., where he focused on developing his skills in restoration work. In 1991, he opened his own business, in Chicago’s Loop, dividing his time between violinmaking and restorations. In 1995, he was asked by Vahakn Nigogosian to serve as an instructor at the Stringed Instrument Restoration Workshop at Oberlin College. He eventually succeeded Nigo as the director of that program, which now concentrates on new instrument making. Chris makes award-winning violins, violas, and cellos from his studio in Philadelphia’s Center City, near the Kimmel Center and the Curtis Institute of Music. He continues his study of classic Italian stringed instruments, lecturing and teaching about violinmaking and repair techniques at venues around the world. Chris is a proud member of The Violin Society of America and the American Federation of Violin and Bowmakers, Inc., and serves on the governing boards of both organizations. During the period between 1550-1750, the arts flourished in Europe. In Northern Italy, particularly in the city of Cremona, a group of violin making families with names you’ll recognize—Amati, Guarneri and Stradivari produced stringed instruments which over time have been considered the greatest from both a tonal and aesthetic point of view. For a long time, there has been speculation that these makers were in possession of a “secret” which enabled them to produce superior instruments to makers elsewhere. I think that the explanation of a single secret is too simplistic an explanation to account for the masterpieces which were produced during this time in Cremona. Perhaps a better explanation is that these makers were geniuses, who perfected their craft in an environment which fostered the arts. It must have been an exciting time to live and work in! Today, we live in an equally exciting time! Technology has grown at an exponential pace and we have access to greater communication and information than ever before. While science may help to unravel much of the mysterious greatness of classic Italian violins, I feel that a greater understanding comes from a thorough and systematic study of the masterpieces themselves. Since I began my career as a violinmaker and restorer, I’ve worked on, studied and documented as many classic Italian stringed instruments as possible in order to produce a modern instrument with similar tonal and aesthetic characteristics to the great Cremonese instruments. In short, my goal is to make stringed instruments worthy of the title: Modern Classics.